"Make a quick and easy brownie using Nesquik®. This brownie is delicious!" 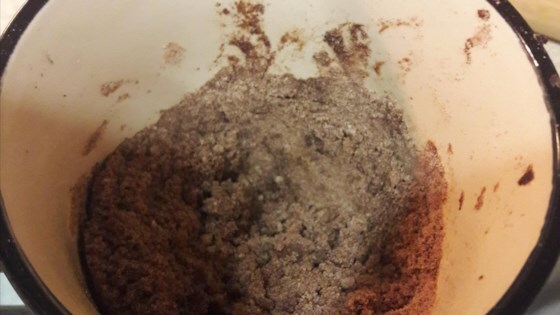 Mix 1/4 cup plus 2 tablespoons powdered chocolate drink mix, flour, and salt together in a microwave-safe mug. Add water and olive oil; stir thoroughly until mixture is smooth. Microwave mixture until center is fudgy and top looks dry, about 1 minute 55 seconds. Let cool for 2 minutes before serving. Didn't work for me at all!! I followed the instructions exactly and still came out as powder and no brownie.. It was VERY crumbly, and the taste wasn't all that great. It was OKAY, and overall not pretty good. Must improve. Very awesome! Perfect quick chocolate fix.